Y. Lambert, Cy Twombly: Catalogue Raisonné Des Oeuvres sur Papier, Vol. VI, 1973-1976, Milan, 1979, p. 164, no. 176 (illustrated). R. Smith, "Art: Cy Twombly at Pace," The New York Times, January 22 1988. 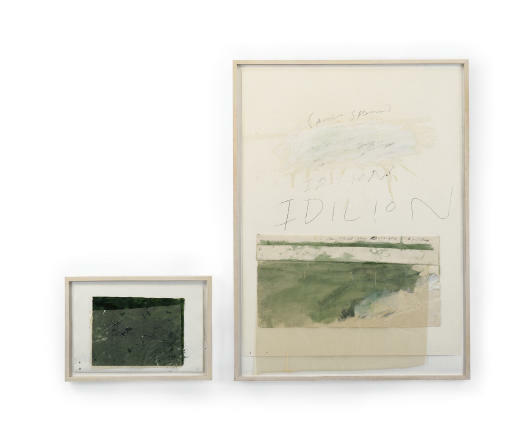 New York, Leo Castelli Gallery, Cy Twombly-Watercolors, September-October 1976. Kassel, Documenta 6, 1977, vol. III, p. 108, pl. 7 (illustrated). Nationalgalerie Berlin Staatliche Museen Preussischer Kulturbesitz and Monchengladbach, Stadtisches Museum Abteiberg, Joseph Beuys, Robert Rauschenberg, Cy Twombly, Andy Warhol: Sammlung Marx, March-September 1982, p. 150, pl. 94. New York, The Pace Gallery, Cy Twombly: Works on Paper, January 1988, pl. 15 (illustrated).